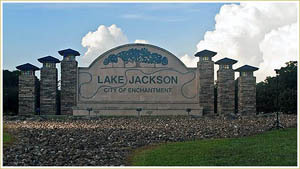 Lake Jackson, "City of Enchantment", originated in 1941 when the great push was on to build the Dow Plants. Dr. A. P. Beutel, first General Manager of Dow�s Texas Division, had an idea when faced with a basic decision as to what could be done to provide living accommodations for the thousands of Dow employees already here and the thousands more to come, Dr. Beutel took a carload of his fellow Dow directors over bumpy country roads to the site of the old Lake Jackson Plantation. He stopped the car and said, "What we ought to do is build a complete new town here!" This was the beginning of the City of Lake Jackson. Founded in 1842, the Jackson Plantation was actually the second of three plantations developed by Major Abner Jackson. Originally known as "Lake Place," it was a bustling sugar plantation that stretched over 6400 acres and was worked by over 80 slaves. At one time, Major Jackson was the second largest owner of slaves in Brazoria County. Major Jackson passed away in 1861 at the start of the Civil War. His four sons joined in the confederate fight, but only two returned home. Soon afterwards in 1866, a grizzly family feud over the Jackson Plantation ensued and ended in murder. The location for the City of Lake Jackson was chosen because of the protection offered from Gulf storms, an elevation which made possible good drainage, and because of its natural scenic beauty. This city of 1300 acres was carefully planned on paper before a single nail was driven. Dow intentionally laid out the streets so that they seldom follow straight paths. Part of the basis for the winding streets was Dow's insistence that as few trees as possible should be removed in construction of the original street layout. Today, of course, these trees give Lake Jackson, a part of the National Arbor Day Foundation's Tree City USA list, a personality all its own.